What shapes your perception of the world more than your eyes? Without proper eyesight you risk losing out on opportunities, the richness of new experiences, and an active lifestyle. At Gerstein Eye Institute, we’re passionate about your eye health. We offer comprehensive eye exams, treatments, products, and procedures to ensure your vision is as clear as possible. 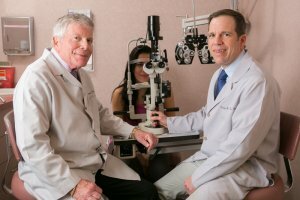 Our team of licensed and board-certified ophthalmologists will resolve any ocular issues you may be experiencing through their in-depth testing. We serve patients of all ages throughout the Greater Chicago Area, and we offer affordable pricing to match any budget. Contact us today to schedule an initial eye exam and consultation. Don’t allow your life to be dulled by poor vision. Did you know over 200 million people worldwide suffer from some form of eye disease? All too often patients suffer needlessly or risk losing their eyesight entirely when avoiding regular eye exams. Clearly, procrastination only causes more problems. Our comprehensive exams will not only detect subnormal visual acuity and major vision problems, but they can also give you a clear idea of your eye’s total health, from your eye muscle strength to spotting the onset of debilitating eye diseases like cataracts, glaucoma, and macular degeneration. When you visit Gerstein Eye Institute, we’ll get to know your medical history, test your visual capacity, diagnose any visual issue or discomfort, and offer affordable and effective solutions. We specialize in ocular products and procedures, and we accept most vision insurance plans. We have over 50 years of experience in the field, we’re the skilled medical professionals you can trust. It’s never too early to have your eyesight examined and your health evaluated. If you’re experiencing blurred central vision, trouble with blurred objects at a distance or up close, eye irritation and redness, consistent eye strain and headaches, spots in your vision, or extreme light sensitivity, you may be at risk of eye diseases such as AMD(Age-Related Macular Degeneration), cataracts, or glaucoma. We offer corrective treatments that can resolve these issues quickly and painlessly. Whether you’re suffering from a bacterial infection, a genetic disorder, or simply need prescription lenses, we’ll ensure your eyesight is restored. Contact our office in Chicago today for more information. Whether you’re in the market for stylish new frames or you need an updated prescription for your contact lenses, we offer a grand inventory of top-brand lenses and frames at reasonable prices. We carry designer frames, both soft and hard contact lenses, and the latest photochromic lenses that can adjust to any amount of daylight within seconds. We also offer a sizeable selection of eyeglass and contact lens accessories, carrying cases and cleaning solutions. Ensure your eyesight stays crystal clear and keep your look up-to-date with high-quality eye products that can only be found at the Gerstein Eye Institute. Connect with us today to peruse our vast selection.